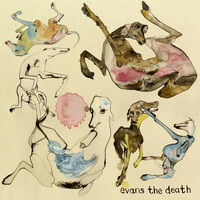 Taking their name from the undertaker in Dylan Thomas’ ‘Under Milk Wood’, Evans The Death first came to prominence in their teens, with their promising, self-titled debut. Three years on, the quartet are back with a superb second album, and a reshuffled line-up. Here, guitarist/vocalist Dan Moss tells us why Expect Delays is “leagues ahead” of their debut, and discusses the anxieties and economic pressures that beset young bands starting out today. Hey Dan, what are you up to? I’m just at home, eating for the first time in 48 hours. Fortunately, this is reading week for me. Last night I was at Katherine [Whitaker]’s, decorating our singles with wine stains; there were 400 of them. It was fun, but I ended up getting far too drunk – on beer though, not wine. It’s been three years since the release of your debut. Looking back on the whole process, how was it for you, and what have you learned as a band? Everything in the last three years felt like a bit of a nightmare apart from the actual making of the record, which was about 0.1% of all that time. It was a pretty unhappy time for me personally, and I think it’s fair to say it probably was for the others too. It’s hard to think of it as a “process”; it seemed to just all come together somehow. The record was made in two sessions with a big gap in-between, because of financial and legal trouble. It was a right p*sser at the time, but I think having that time to reflect helped the record enormously. I don’t know if we learned anything in particular... I guess we’ve become more cynical, but we’ve also become more aware of who we are as a band. We were teenagers when we made the first record: everything’s progressed now, we’re leagues ahead. In the time since your debut there’ve been a few line-up changes. Can you talk us through who’s gone, and who’s doing what now, please? OK. Matt [Gill] was there from the beginning; he played second guitar on the first record and he’s still a very good friend. It was loads of fun having him in the band, and he’s a great guitarist, but he just wasn’t as serious about it as we were; sometimes he just wouldn’t turn up. It started out just the three of us playing acoustic shows in about 2008, then we tried having a full band with these other guys on drums and bass but they were just totally wrong. So, in late 2009, we got Olly [Moss] in on bass and Rob [Mitson] joined on drums, and that’s when we first started sounding like an actual band. Rob played on the first record but, for various reasons, it wasn’t working anymore. I think the tipping point was him bailing out of a show as the rest of us were already heading to soundcheck, which meant a very strange, drummer-less show. So he was asked to leave, and none of us have heard from him since. Alanna [McCardle] joined on bass in October of 2011, after we’d made the first album, and Matt had left, so Olly switched to guitar. 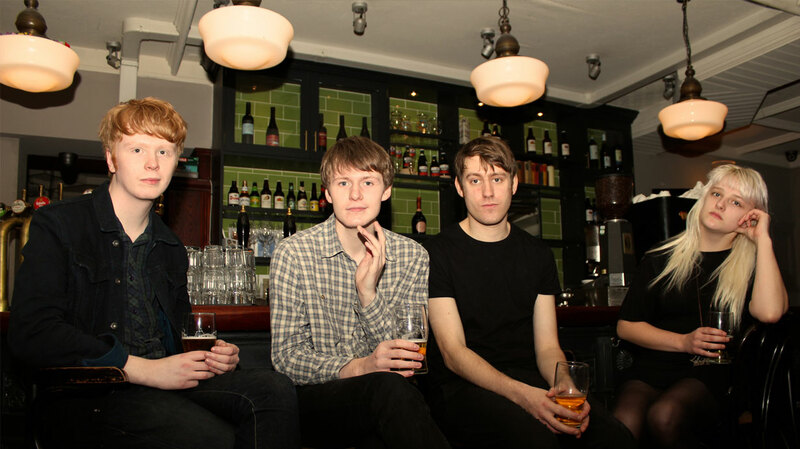 Lan left in August of 2012 – before we started work on the second record – to focus on Joanna Gruesome and Ides. James joined on drums in November of 2012 after moving to Leeds from London and has been doing a great job. Olly and I have been switching between guitar and bass, but we’ve recently been practicing with a new bass player, Daniel, and it’s sounding good. It’s been kind of messy but I do think changing things up occasionally can be a good thing. Wow. So what impact has the new line-up had on the songwriting process? I mean, people bring their different playing styles to it, but the writing and arranging has always been down to me and Olly. Initially, I was more dominant but now it’s pretty even between us two. Katherine sings our words but her phrasing and interpretation is very important to the songs. Maybe in the future we’ll be a more collaborative band but up ‘til now, that’s the dynamic. We’re really enjoying Expect Delays. What was the goal, sonically? Were they any specific reference points? Thank you. The goal for the record was for it to include everything and to not repeat itself; that’s kind of our approach to the band generally. It has a lot more scope than before. The idea of having specific musical reference points that are fixed is just total anathema to us; I think that’s what’s wrong with most music these days. If we reference something, it’s just flippant – like, Thin Lizzy guitars for a few seconds, or slowed-down Lil Wayne vocals – it’s just taking the p*ss to occasionally lighten the mood a bit. We knew it had to be better than [the first album]. We were teenagers when we made the first record: everything’s progressed now, we’re leagues ahead. When was the album recorded? And how was the process? Presumably, you were a bit more studio-savvy this time round? We made it in a studio on a big, red ship, moored on the River Thames, in a total of 12 days in February and November of 2013. It was a lot more fun [to make] than the first one. I mean, actually being in the studio and working, we felt totally free. Olly and I have always taken an interest in production and recording techniques, but we did feel much more confident. I think it was just a matter of giving up on trying to please other people. And I think I learned that it’s important to manipulate time; like, some things you’ve got to think about for years and other things you’ve got to do literally at the last minute. Also, sometimes you’ve got to work completely sober, sometimes it’s better if you’re not. As with your debut, Expect Delays was produced by Rory Attwell. What is it you like about his approach? Rory’s one of my best friends, so it’s a lot of fun. It can get quite intense, but we’re also prone to acting like children. We’ve only ever recorded with Rory, and I can’t imagine doing it with someone else; stomping around their plush, Chicago studio like they’re in the bowels of an Alaskan oil rig, in a ridiculous little blue boiler suit. [Rory’s] good because he knows when to let you do your thing and just be the engineer, and when to give his input or give us a kick up the arse. We usually have a pretty clear idea of what we’re after, but he definitely encourages experimentation. Thematically, there’s an interesting mix of melancholy and humour. Where were you drawing inspiration from? We just write about how it feels to us to live in our particular environment. I guess we write a lot about anxiety, desperation and isolation, and the focus is almost always on mundane details of everyday life. The overarching theme of the album is the sadness of things failing to connect, either personally or interpersonally. There is also this self-reflexive thing of laughing at ourselves about all that; sort of admonishing ourselves for whining, whilst whining. I don’t want to be writing lyrics in this way forever, though. Your press release attributes the sense of melancholy to “three years, spent eking out an existence on the poverty line in Cameron’s Britain.” Is that a bit of poetic license, or is that a fair appraisal of the past three years? It’s not an overtly political record, but it doesn’t feel like a very good time to be our age, doing what we’re doing, and that probably gets in there. It totally stresses me out being broke; it’s partly why I ended up drinking so much and really not taking care of myself for a long time. And I got a lot of the ideas during hangover/sleep deprivation-induced panic attacks. It does feel like, in the past few years, that whole, glamourous mythology surrounding being in a band is rapidly crumbling away, and people are realising that – actually – it’s a lot of hard work. What makes the experience worthwhile for you? I think, these days, being in a band is a brave thing to do, but I do feel embarrassed about it to the point where I just don’t tell anyone. Like, no one at university has any idea I’m in a band; people just think you must be a moron. At the same time though, the band is the only thing in my life that I’m proud of, and I enjoy it. I like the physicality, emotional catharsis, creative challenges, having a gang and seeing new places. If you were to give one piece of advice to bands starting out now, what would it be and why? I don’t think I’m in a position to give advice, although, as nearly everybody else seems to be doing it wrong: don’t be a sycophant; steal as much as you want, but bear in mind that you wouldn’t nick from the same shop twice, you might get recognised; make sure you’re having fun. Oh, and you don’t need to have a manager. What would you like listeners to take away from the album? Absolutely whatever they want – I have no say in that. I just hope that people give it time and listen properly and think about it. Although, I think most people have got the hang of that, apart from maybe some music journalists. What’s the plan for the rest of 2015? We’re going to be touring a lot over the summer – UK and Europe at the very least – and odd shows throughout the year. Who knows what else. And where would you like to be with Evans The Death this time in 12 months? I would like to just keep on making records indefinitely, but we’re not going to force it; it will happen whenever the ideas are there and they’re good enough. Also I really want to play in Japan.